China Railway Corporation (CRC) Beijing Group on Monday denied that the air on its new bullet trains contained excessive formaldehyde, contradicting a recent investigative news report. Excessive formaldehyde has never been detected in the Fuxing bullet trains, and they have not been required to stop operations, reads an announcement on the official Weibo account of CRC's Beijing branch. The announcement came after a China Business Journal report claimed that excessive formaldehyde was found during an air quality check in several new trains and that the Beijing branch has reported the problem to CRC's national office which has refused to put the new trains into operation. The report cited an anonymous source from the CRC Beijing Group. The source did not reveal the exact amount of formaldehyde found inside the train cars. 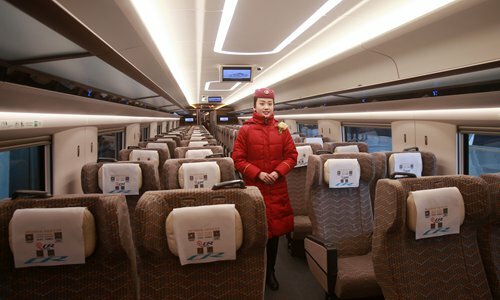 The CRC is always concerned about environmental issues and passengers' health and will not use trains that fail to meet standards, CRC's Beijing branch said. The group admitted that several of the new trains have not been put into use because of ongoing testing and odors on the new trains. Fuxing bullet trains are China's latest model of high-speed trains that can travel up to 160 kilometers per hour.